Barrie Colts and the NHL Draft. - Very Barrie Colts | A website covering the Barrie Colts of the OHL. 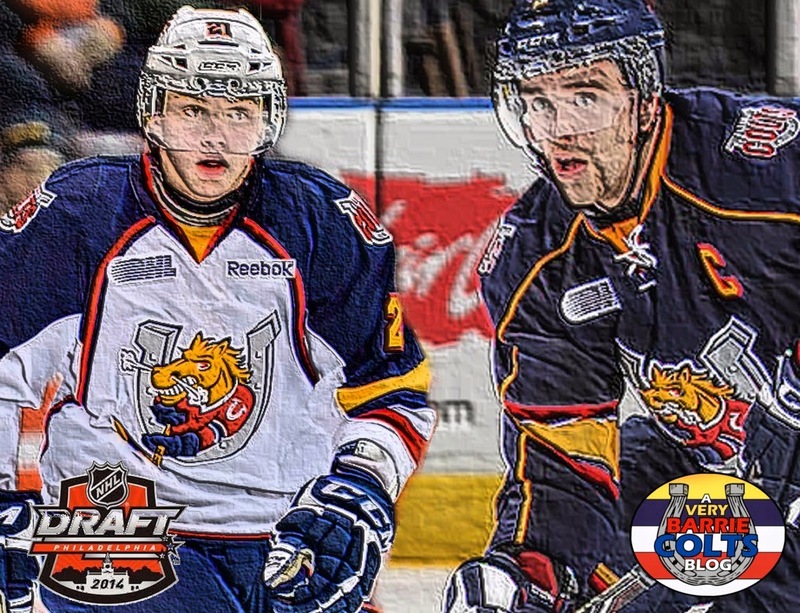 Home Aaron Ekblad Barrie Colts blog Brendan Lemieux NHL NHL Draft OHL Barrie Colts and the NHL Draft. Barrie Colts and the NHL Draft. This week is the 2014 NHL Draft that is taking place in Philadelphia. This year it looks like there is a good chance that Barrie Colt Aaron Ekblad could get selected first overall. It also appears that there is a good chance that Brendan Lemieux could get selected in the first round. To find out the last time two Colts were selected in the first round you would have to go back to the 1999 season when Brian Finley was selected by the Nashville Predators (6th overall) and Denis Shvidki was selected by the Florida Panthers (12th overall). 1999 was not only the first year that multiple Colts were selected in the first round but it was also the year that the most Colts were drafted. 6 Colts were drafted. Aaron Ekblad could make Colts history if he is Drafted first overall. It would be the first time a player was selected 1st overall from the Colts. The highest drafted player in Colts history to get drafted into the NHL was Alexandre Volchkov. He was selected by the Washington Capitals 4th overall in the 1996 draft. Here is a breakdown of Barrie Colts getting drafted into the NHL in the teams history. Tanner Pearson - Drafted 30th overall by the Los Angeles Kings. Alex Lepkowski - Drafted 137th overall by the Buffalo Sabres. Alexander Burmistrov - Drafted 8th overall by the Atlanta Thrashers. Dalton Prout - Drafted 154th overall by the Columbus Blue Jackets. Kyle Clifford- Drafted 35th overall by the Los Angeles Kings. Alex Hutchings- Drafted 93rd overall by the Tampa Bay Lightning. Michael Hutchinson- Drafted 77th overall by the Boston Bruins. Stefan Della Rovere-Drafted 204th overall by the Washington Capitals. Brian Little - Drafted 12th overall by the Atlanta Thrashers. B.J. Crombeen - Drafted 54th overall by the Dallas Stars. Jeremy Swanson - Drafted 169th overall by the Florida Panthers. Jan Platil - Drafted 218th overall by the Ottawa Senators. Tim Branham - Drafted 93rd overall by the Vancouver Canucks. Mike Danton - Drafted 135th overall by the New Jersey Devils. Eric Reitz - Drafted 170th overall by the Minnesota Wild. Brian Finley - Drafted 6th overall by the Nashville Predators. Denis Shvidki - Drafted 12th overall by the Florida Panthers. Sheldon Keefe - Drafted 47th overall by the Tampa Bay Lightning. Ed Hill - Drafted 61st overall by the Nashville Predators. Andre Lakos - Drafted 95th overall by the New Jersey Devils. Scott Cameron - Drafted 185th overall by the New Jersey Devils. Michael Henrich - Drafted 13th overall by the Edmonton Oilers. Martin Skoula - Drafted 17th overall by the Colorado Avalanche. Adam DeLeeuw - Drafted 151st overall by the Detroit Red Wings. Daniel Tkaczuk - Drafted 6th overall by the Calgary Flames. Nick Smith - Drafted 74th overall by the Florida Panthers. Keith Delaney - Drafted 155th overall by the Florida Panthers. Jeff McKercher - Drafted 189th overall by the Dallas Stars. Alexandre Volchkov - Drafted 4th overall by the Washington Capitals. Jan Bulis - Drafted 43rd overall by the Washington Capitals. We hope this blog informs and entertains, we hope it distracts you from your daily worries, we hope it makes you chuckle at our silly photoshops and most of all we hope it inspires you to love hockey the way we love hockey.